You are about to take your Open Water Diver Exam, Divemaster Exam or Instructor final exam and we want to make sure that you pass. You have read your course material, but you are feeling a bit uneasy about the upcoming written final exam. Not to worry. 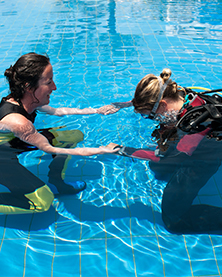 We have created Open Water Diver, Divemaster and Instructor practice exams to help further your study and to make sure that you will pass your final. We realize it’s not always easy to remember all the material you just covered. That’s why we created an incredible amount of practice exams to ensure that you are prepared for your final. Each time you complete an exam, you can then retake the quiz with a new set of questions. Go ahead. Dive in and try our set of practice exams. People fail the IE typically because they fail the written final exams. For this reason, we give you plenty of practice. 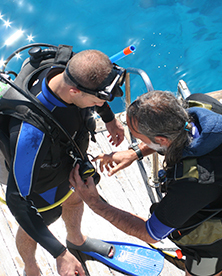 You get over 20 practice exams in both the Standards and Procedures and the Dive Theory sections. "It was nice that I had extra practice before taking my IE. Your site had at least 10 various practice exams to go through. I'm glad I had the practice. Definitely recommended before doing your final." 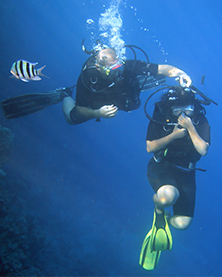 "I was a little nervous about the 50 question Open Water Diver final exam. These practice exams turned out to be a life saver. The practice exams were in the exact format as the actual final. I aced my final exam..Thank you." "I felt really confident after taking these practice exams. The way your questions and answers were shown was a great help for me. The practice exams were in the exact format as the actual final. I passed my Divemaster final."